I chose to do my research on work at the University of Toronto’s Anti-Racism and Cultural Diversity Office (ARCDO). 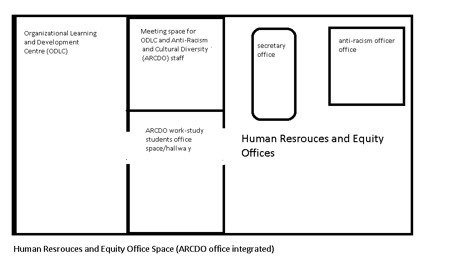 ARCDO is part of the University’s equity offices network and works closely with stakeholders on campus to enable the University’ academic mission and eliminate racism and systemic discrimination on campus. Doing anti-racism work at the University is challenging, specifically because the roles of eliminating racism and advancing the University’s mandate exist in tension with each other. Although ARCDO frames the simultaneous achievement of these objects as entirely compatible, my research reveals that one is in fact being advanced at the expense of the other. In “On being Included”, Sarah Ahmed (2012) argues that equity policies are often circulated rather than instituted, which allows universities to not only continue with problematic policies, but also to deceptively market themselves as equity-oriented. This is certainly the case for UofT, which despite being named “Canada’s Best Diversity Employer” for nine straight years, has consistently marginalized ARCDO and its efforts via financial and other means. The question I am exploring in my research project is how the anti-racism work done by ARCDO employees becomes aligned with the University’s mandates of image and reputation management in the face of these glaring tensions. This question is directly related to the issue of co-linearization (i.e. the neo-liberal undertaking of aligning the desire of the employee with that of the employer), which is one of the key work-themes we discussed in our class, building on Lordon. My exploration of this question consisted of formal interviews and also a great deal of participant observation. Participant observation allowed me to see how employees at ARCDO, and specifically the work-study students, negotiate their conflicting role demands. We looked at different ways in which entrepreneurship is being promoted among technically oriented students at the University of Toronto. We attended entrepreneurship events as diverse as those organized by the Department of Electrical and Computer Engineering, entrepreneurship accelerators (helping U of T students launch their own startups) and the student club Engineers Without Borders (focusing on international development). We also interviewed current engineering students about their future career plans. In studying the production of the work ready student at the University, I pursued ethnographic research at three interconnected field sites. I began research at the Center for International Experience (CIE) where I was interested in understanding how international experiences help students gain work relevant skills; then, I stumbled upon the Co-Curricular Record (CCR) as a second field site where I was interested in learning about how experiences of working, interning, and volunteering at the University are compiled into a record which is meant to capture and represent the skills and competencies which a student learns. Given these two sites where students gain relevant experiences, skills and competencies which are supposedly desirable to the employer I became interested in the work that the Career Center does in helping students to translate their experiences into a format that is intelligible to future employers. Through work at the CIE, CCR and Career Center I found myself following the processes by which students translate their experiences into presumed employability. Students are target audiences for many communications and media-related products, from recruitments videos for a particular program, to Boundless banners posted around the campus, to promotions of events or recent news on websites and social media. However, many students and other members of the U of T community are unaware of the behind-the-scenes of this highly visible content – who, what, and how? In order to learn and understand communications work at the U of T, I pursued my ethnographic research through job shadowing a communications worker for a program which is part of a larger (highly specialized) faculty on St. George campus. This involved three job shadowing opportunities – sitting in a meeting discussing a website-related project, another larger meeting with other communications workers of the faculty at which a worker from central communications made a presentation; and observation of the shooting of a recruitment video for the program, along with a semi-structured interview. Focusing solely on one specific communications worker would not provide a grander picture of how communications work and workers interact at the U of T. Therefore, I conducted a semi-structured interview with another communications worker of a different (highly specialized) faculty to compare the kinds of tasks and responsibilities, and worker’s relation to his/her work and other workers. Furthermore, due to the ambiguous decentralized and centralized organizational structure of communications work at the university, I decided to also investigate the work of the central communications office to understand what discussions are happening among the main image-makers and media representatives of the U of T, and how they perceive their role and in relation to “decentralized” or faculty-based communication workers. The Career Centre served as the site for our research project. The Career Centre is located within the Department of Student life located at the Koffler Student Services Centre on 214 College Street. The large room also serves as the academic success centre. Upon entering the space there is a welcome desk that is operated by two attentive students workers who assist students with any immediate inquiries about the Career Centre. There is a shelf that is lined with a number of pamphlets, booklets and flyers that detail different events and resources offered to students by the Career Centre. There is a large staircase that leads to private offices upstairs. The space also serves as a computer lab but there are a number of designated areas where students can meet one on one with either a career counsellor or to discuss their academic needs. Currently The Career Centre is undergoing a large-scale renovation until March 2017. It has temporarily set up offices on the second floor of the Koffler Building and currently shares the space with Housing Services. This space appears less formal. The reception desk is shared with the Housing Services office and both receptionists are seated side by side. The office appears cramped and marking the difference in space seems to be an apparent issue. The room consists of cubicles with more offices located in the back of the room. It is important to note that this space was under an extreme renovation throughout our fieldwork, so operations at the Career Centre were modified. We attended several staff meetings that were held either at the Career Centre in conference rooms, or at the Centre for International Exchange. Meetings were typically with 4-10 staff and were often co-facilitated by ‘seniors’ and those beneath them. Staff meetings usually discussed daily goings-on, future plans, obstacles that arose throughout the line of work, etc. Together, staff would typically discuss and navigate potential solutions or ways to improve their resources. We also attended several workshops offered by the Career Centre. These were housed at both the Career Centre and the Centre for International Exchange in smaller, intimate conference rooms. Workshops typically consisted of anywhere from 5-25 students and recent graduates. Workshops were facilitated by both student-staff (ie. work study students) as well as Career Educators. The workshops sought to avoid pedagogical approaches to learning where educators simply lecture, instead offering peer to peer based learning and discussion. Typically, attendees and the facilitator shared thoughts, questions and learning around the table. Workshops were usually 1-3 hours. It was interesting to see the Career Centre as it is (described above) as well as to compare it to the ‘product’ which they offer (ie. the workshop), to see how the difference in space reflects the learning process and subjectivity the Career Centre seeks to instill upon those accessing their resources. Upon beginning my research, I assumed that finding my field site would be relatively straight forward. Building Patrol is a division of the Campus Police Office, and so I started there. After a few unsuccessful attempts to make contact with the Building Patrol manager, I began to search for an alternative entry point. This was made somewhat difficult by the fact that there is very little information about the organizational system of security at UofT online. Based on what was available, it seemed that the system was a centralized enterprise which operated directly under Campus Police. In my stumbling around, I happened on a few different sites of security which are not publicly advertised. The first of these was a security office at one of the libraries at the St. George campus. It was clear that security guards checked in here, and when I spoke to someone who looked like a manager, he informed me that he “somewhat runs the show around here”. This pointed to a sort of quasi or unofficial hierarchy within the building security apparatus. Upon further attempts to find a field site at various colleges and other buildings on campus, the image of a fully centralized and unified system began to break down. Some buildings hired out their security staff through a third-party company, while others, such as college residences, relied mostly on student porters and residence dons. Unincorporated and scattered patterns of building patrol at various sites revealed multiple points of fracture within the campus security system. Intrigued by their highly visible yet mysterious role at UofT, I decided to focus my ethnographic research on the everyday work of campus security guards. Operating at the lowest level of the security enterprise at UofT, I was interested in how these guards contributed to the creation of a “safe” and “secure” university. After many initial obstacles, I was able to get access to patrol guards in various areas of the university. I accompanied these guards on a range of patrols, including weekday, night, and weekend patrols. I was very interested in learning what these guards actually do, the physical and material work that is involved in securing the campus, and how their duties did (or did not) fulfill this. In answering these questions, accompanying guards on their patrols proved very insightful, as I was able to view and experience firsthand the kinds of tasks carried out on a day to day basis. After the first week of our collective “entry into the field” into our specific field sites, our class, in the spirit of shared knowledge, came together to discuss what practices were thus far working, what was difficult, what we were struggling with and our working plan of action for moving forward in our projects. Together, we strategized a general “how to” on the actuality and practicality of studying “work” – as a concept, as a multilayered practice, as sets of relations and as a dynamic and fluid entity. We quickly came to understand that work at the University of Toronto operates at two very distinct yet interrelated levels: everyday work in the domain of the university that we can easily observe: food service workers, students studying in the library or a professor offering a lecture. But, what we don’t see is the “mysterious” side of work. What goes on behind the scenes? What are the hidden domains of work at the University? Who occupies the offices we never see? Who are these people and what do they do? Below are some of the most effective and efficient strategies we employed, to greater and lesser extents, to study both the seen and the unseen of “work” at the University of Toronto. To begin, some of the questions we found helpful to direct our focus in how to study work involved looking at the “basics” of work: what do people do all day. What are the events of their day, their routines and timelines, or the temporalities of work? Where do they do these things? What do they wear and how do they act? How does the structure of their space or their environment influence the nature of their work? Moreover, we agreed that it may be helpful, as a means to practically study work, to look at the “who” of work: who is doing this work? Who interacts with who, and on the basis of which ranks? Which people work together? In the context of the university, we found it particularly helpful to look at the “who” in terms of student workers versus non-student workers or co-curricular credit workers versus voluntary workers, as a key mechanism to understand valuation systems of the different work completed at the University and different hierarchies. It became clear to us throughout our brainstorming sessions, that “work” does not occur in a social vacuum. Thus a key tenet of “how to” study work also involved looking at the outputs, or products of work: where does the work of the university go? Is a material output offered ‘at the end of the day’ or are workers implicated in immaterial labour? One may contrast two student projects here: the work of the Communications Department producing material (such as advertisements) for student consumption versus the work of the Career Centre in offering career-based educational services for students, an immaterial form of labour. Moreover, we found it helpful to look at the the relationship between the worker and their work. What happens after the work is completed? We attempted to answer the questions above through creating organizational charts of how workplaces are structured, by analyzing internal documents and reports, by “following the money” to see who is paid what or which departments have the highest revenue or expenditures, by studying the spatial layout or allocation of space of workplaces within the institution, by probing interlocutors for answers and following different lines of inquiry. For myself, simply sitting in on staff meetings or Career Centre sessions was a highly effective way to find lines of inquiry I wanted to pursue. It was in these spaces that I was able to glean how workers interacted. I could see that workers (in my case, Career Educators) interacted differently with each other at a staff meeting than they did with students at an educational session. It was also at staff meetings, a relational context, that I could investigate the nature of hierarchy at the Career Centre: who was a senior educator? Whose voice was listened to? Who stayed quiet? And so forth. Generally speaking, each of my classmates employed different strategies to really get at the crux of “work” at our own individual fieldsites. However, it was the above questions and topics which we found most useful in guiding our descriptive and analytical inquiry into the “how, what, why, where and when” of work at the University of Toronto.